Opt for an office coffee service solution that gives more variety with dozens of coffee types brewed on one machine. The LCD interface makes the machine easy to use. Its durability, automatic ejection and used K-Cup Pack storage holder make it a low maintenance addition to your break room. Employees don’t need to worry about clean-up or waiting – 60 seconds and they're done. AUTO-EJECTS and drops into a convenient K-Cup pack storage bin for later disposal after each brew. The brewer will also alert you when the bin is full. FLIPPABLE DRIP TRAY is designed to accommodate large-capacity travel mugs. It's easy to clean and is dishwasher safe. BREW SIZES : 4 oz, 6 oz, 8 oz, 10 oz, 12 oz. DIRECT PLUMBED makes for a water supply ready for back-to-back brewing. BREW TIME & BREW VOLUME is fast and fixed. 4, 6, 8, 10, or 12 ounces of freshly brewed coffee in under one minute at the touch of a button. VERSATILE DRIP TRAY is designed to accommodate accidental spills so as to prevent mess. It's easy to lean and is dishwasher safe. QUIET BREW TECHNOLOGY™ feature minimizes noise during use. NSF CERTIFIED means this brewer has passed extensive testing and analysis of the National Sanitation Foundation. COMMERCIAL GRADE ensures built to commercial specifications and UL-Listed for commercial use. The K150P is a rugged machine. 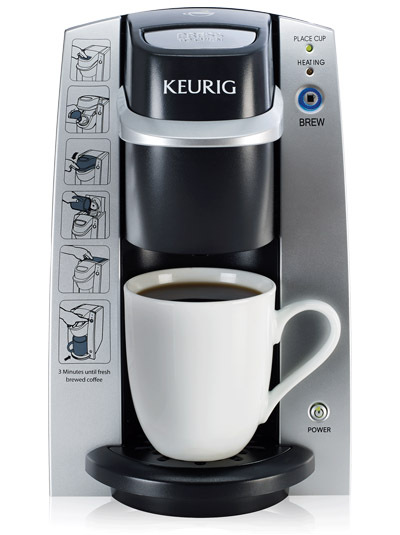 Brew your favorite beverages at the touch of a button with the Keurig® K1500™ Coffee Maker. The K1500™ commercial brewer is fully featured for effortless beverage customization, including 4 cup sizes (6, 8, 10, and 12 oz. ), and a STRONG button that increases the strength and bold taste of your coffee's flavor. And with over 30 brands and 150+ K-Cup® pod varieties to choose from, brewing the perfect cup of coffee, tea, or hot cocoa has never been easier. The K1500™ brings Quiet Brew Technology™ that minimizes noise while in use, and an extra large 96 oz. water reservoir that makes refilling and cleaning a snap. BREW SIZES : 6 oz, 8 oz, 10 oz, 12 oz. BREW TIME & BREW VOLUME is fast and fixed. 6, 8, 10, or 12 ounces of freshly brewed coffee in under one minute at the touch of a button. STRONG button delivers a bolder, more intense flavor. With Keurig®, it's always a fresh cup. 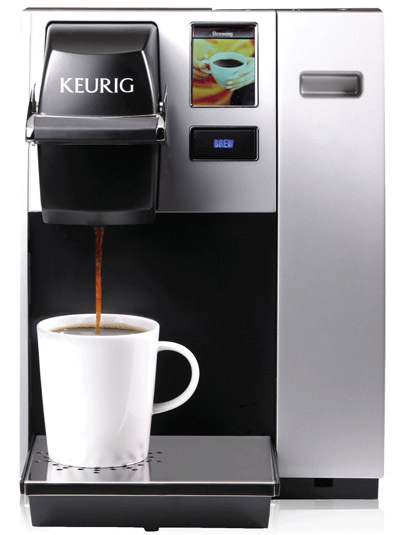 It's a touch of home away from home with the Keurig® K130 in-room brewer, designed for hospitality. Its step-by-step intrustions allow any guest to operate the machine with ease. 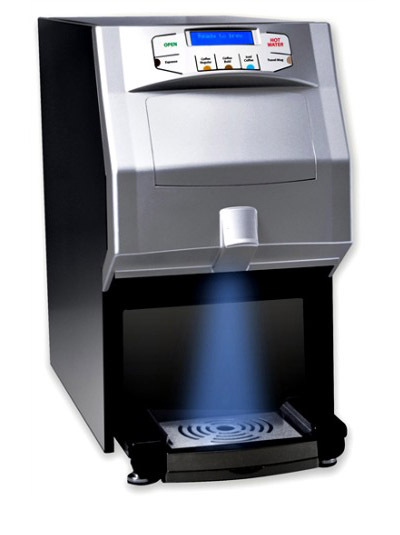 Your staff will love it because with the K130, there are no carafe or drip baskets to clean. There are no grounds or wet, messy filters to pick up. All brewing takes place within the K-Cup® pack which is easily disposed of, with zero mess. BREW SIZE : 8 oz. SPACE SAVER – Fits Anywhere. With only 7W x 10D x 11H inches of space, it can be placed anywhere. MUG SENSOR will alert you if no mug is present so there are no accidental spills. ENERGY SAVE MODE – When the brewer is not in use, it turns itself off automatically, increasing safety and using energy efficiently. HOUSEKEEPING FRIENDLY makes for virtually no clean up and no water left in the brewer between uses. BREW TIME AND BREW VOLUME is fast and fixed. Eight ounces of freshly brewed coffee in under three minutes. FOLLOW ALONG directions are right on the brewer. Easy to read pictorial instructions printed on the face of the brewer make for no confusion. The FLAVIA Creation 500 blends stylish design with enhanced drinks and menu display options. The ideal drink machine for large offices, the Creation 500 crafts authentic coffee, tea, hot chocolate and specialty drinks like lattes and cappuccinos. All drinks can be brewed in small, regular or large size, and you can even brew drinks over ice! PORTABLE AND FLEXIBLE – with pour-over and plumbed-in options for easy office placement. ENHANCED LCD MENU DISPLAY for a more intuitive brewing experiences. DELICIOUS RANGE OF DRINKS – (Coffee, Cocoa, Teas, Whipped Drinks) each brewed in less than a minute. PATENDED BREWING PROCESS prevents cross-over in flavor from one drink to the next. 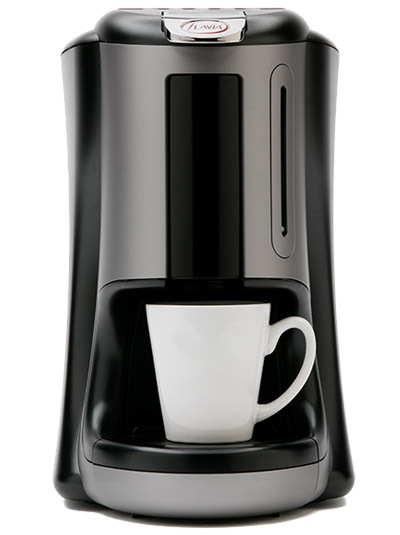 BUILT IN FUNCTIONALITY allows you to brew hot drinks "over ice" for refreshing iced beverage. Flavia's C200 is a single-cup brewer that uses unique filterpacks. 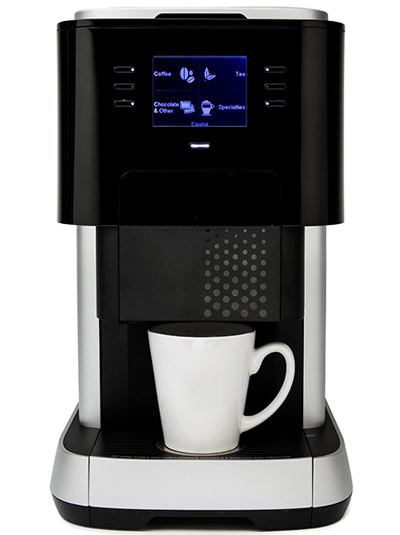 The C200 makes Mars Drinks' full line of coffee and tea available to small-to-mid-size offices. 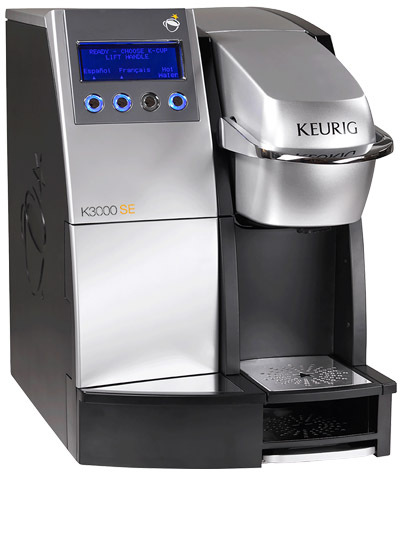 In addition to coffees, teas, and hot cocoa, the C200 has a "two-pack" option to brew "indulgent" drinks such as cappuccino, mochaccino, and chai latte. Thanks to their ease of use, Flavia machines have become our most popular line of office coffee equipment. Gone are the days of the office quarrel over which blend of coffee to brew, and dealing with hours-old coffee in cumbersome glass pots that no one wants to clean. With Flavia's sealed brew packets, each user can brew their own cup of true, fresh coffee, on demand in under a minute. Waste and clean-up are nearly non-existent. PORTABLE AND FLEXIBLE – can be used as a pour-over or plumbed in. SMALL AND COMPACT ideally suited for small spaces with limited counter top space. No matter how you may enjoy your coffee, Fresh Cup always brews it to perfection and allows each cup to be specially brewed to three personal strengths: mild, medium or bold. Your coffee profiles are easily programmable and provide complete control over the critical brewing parameters: pre-infusion, brew volume and water contact time. The stylish facade of the Newco FreshCup 3 is the perfect touch to any break room, but its durability makes it perfect for the grind of day-to-day office activities. 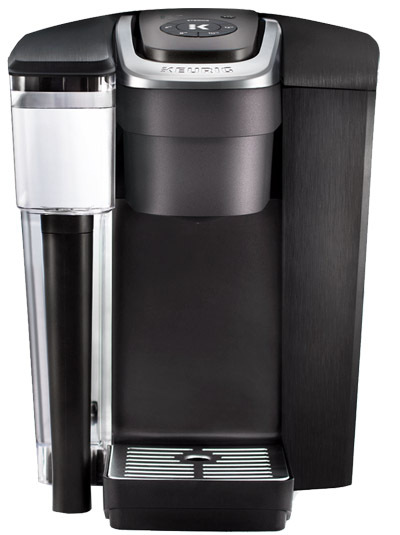 The sleek look includes an innovative design with diverse features that make this brewer top notch. The appeal of the the FreshCup 3 is its five programmable recipes. From espresso to mild to iced coffee, you can brew your caffeinated beverages just the way you like. Employees and customers with all different tastes can find their perfect cup within this machine. ENERGY SMART E- Choose from three different power modes to conserve energy during periods of non use. CUSTOM BRANDING – Fresh Cup's entire front can be custom branded with your company’s image. PROGRAMMABLE RECIPES Mild, Medium, Bold, Espresso, and Iced choices are available so you can brew just the way you like. MODERN DESIGN provides a professional look which blends well in any location. HOT WATER dispence button for all allied products.